Write code. Save. FTP the file. Check it in the browser….repeat. This is what web development was like when I started creating websites….maybe some of you remember those days. Today, we can create a new Ember app with just one command. And Thanks to tools like ember-cli-deploy, even that is one simple command. When I use Netlify, I can deploy an entire Ember application with the push of a button. We’ve come a long way from the days when we needed to know how to set up a server because that was the only way to get our content online. We have come so far and have accomplished so much since HTML was developed in 1991. We’ve done incredible things since the first browser in 1993. We’ve even come a long way since the first hint of Ember in 2011. We’ve seen some very cool applications come to life as a result. 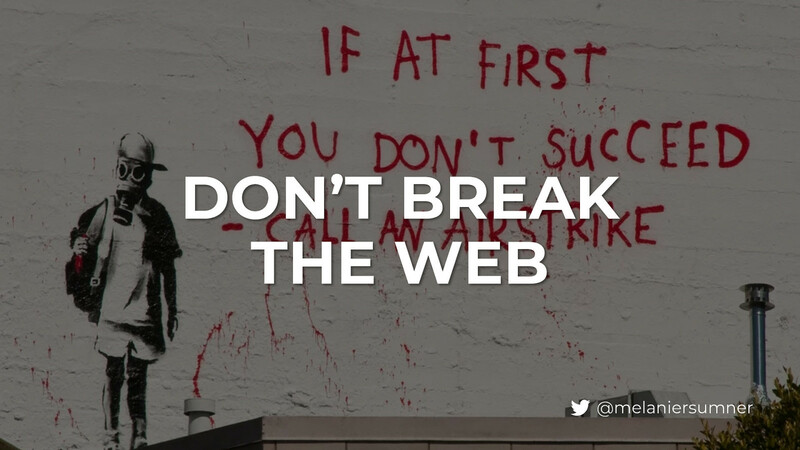 But despite all of this, we’re breaking the web in ways that sets us back farther than where we started from. In February, the WebAIM project at Utah State University published an accessibility analysis of the top one million home pages on the internet, and the data confirms the same things that accessibility advocates have been trying to tell us for years- we are consistently delivering a broken web to millions of users, and we don’t really seem to be focused enough on fixing that. I want everyone here and watching at home to go read this study- after I finish my talk, please . But let’s talk about this study a little bit, and what it means for us. The home pages of the (top one million websites) were analyzed with automated accessibility tools that already exist and are free to use. These tools check for preventable errors, errors that never need to make it to the codebase, and even if they do, they are easy to check for- right from the browser! The results might shock you. This is what they found: 59 million errors. That’s an average of 60 errors per home page. 97 percent of home pages had accessibility errors. 97 percent of the top one million home pages have accessibility issues. The presence of JS frameworks indicated a higher number of accessibility errors. However, we also all know that the single page application isn’t going anywhere- and nor would we want it to. We are all here because we understand this. But folks, the data is telling us a story , a story that might sting to hear, even if it doesn’t hurt. The data is telling us that we have repeatedly chosen to ignore accessibility for far too long. We’ve made excuses. Our naysayers just don’t understand us. They just don’t get what we are trying to do. But maybe, just maybe, right now they have a point. In all of our intent to do good, to be clever, to make web development easier for ourselves, we have become the problem by moving the web backward. The things that used to be accessible simply are not accessible in JS frameworks. We did this by allowing ourselves to forget the important things. We need to ask ourselves, are we focused on the right things? We focus on performance, but have we forgotten- or maybe never even learned- that we can get performance improvements from semantic HTML? We are making preventable errors. 85% of home pages had low contrast text. 68% of pages were missing alt text on images. 58% of pages had empty links. 53% were missing labels on their form imports. There are too many excuses that we tell ourselves for avoiding accessibility in our applications. “Our clients didn’t ask for a11y” Our clients don’t ask for a lot of things. They don’t specify that the app has to successfully build. They don’t specify that we need to have tests. They don’t specify the folder structure we implement in our code. They shouldn’t have to specify things they trust us to provide. Accessibility should never have been something they needed to specify. I’m going to ask you to imagine something for a moment. You’re walking down the street, and the weather is just perfect. You feel happy. You’re just walking and being happy and enjoying the perfect weather, and you see a cookie in a bakery window. Now this cookie, it’s the best cookie you’ve ever seen. It’s your favorite. Everything you love about cookies seems to be embodied in this cookie. So you go into the shop and you purchase it from the baker…only to find that there is no sugar in the cookie. "You didn't ask for sugar in your cookie"
I think we likely could handle a reality check on this. So let’s review things that are genuinely difficult to do. Sending a human to outer space. Hard. Walking into Mordor. One does not simply walk into Mordor. Keeping plants alive. Hard.I have not been able to do this yet. Excuse: not an Ember issue. I’ve heard the idea that this isn’t an Ember issue, that we don’t want to tell people how to build their applications- but I don’t buy that. We are explicitly known for strong conventions and well-lit paths to successfully build applications. The people who use and love Ember appreciate the strong conventions that allow them to start building on the 20th floor. So Instead, we could start to stand up for the semantic web, and reap the performance benefits that come along with it. One way we are doing this now is with the optional feature- application-templatewrapper. To this. Tidy code IS an Ember issue. We have existing addons that need your help and contributions! Ember-template-lint, ember-a11y-testing, and more. Find them. Contribute to them. Let’s gather around and lift up our existing shared solutions and make them truly first-class. I am calling on each member of our community to use assistive technology. Get a feel for how it works. Léonie Watson has recorded a video for Smashing Magazine that talks about screen reader use. When you go home from this conference, find it and watch it. See how a person with no sight uses AT to use the internet. Try it out yourself. You have voiceover that comes with a mac, and other options like NVDA and Firefox on a windows PC. We are all a work in progress. Passion, patience, and persistence will win. A little progress each day adds up to big results. We can do this. I believe in our community! View Don’t Break The Web on Notist. In this Smashing TV webinar recording, join Léonie Watson (a blind screen reader user) as she explores the web, and find out about some unexpected properties of HTML elements that not only have a huge impact on accessibility, but also turn out to be pretty good for performance, too. Simple, flexible deployment for your Ember app. Favorite #EmberConf talk of the day: @melaniersumner driving home the facts about accessibility on the web. We broke it- it’s our responsibility to fix it.